In Kenya’s Tana River Delta - an area plagued in recent years by ethnic violence - a new project is trying to defuse tensions by tackling the trigger for most attacks: rumors, which often spiral out of control. The project aims to make people think twice about what they hear about their neighbors. In August 2012, Omar Bocha got news that a village not far from his had been attacked. Bocha ran two kilometers to reach the place, and when he arrived he could hardly believe his eyes. 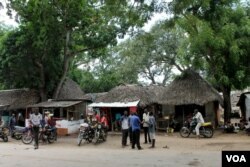 What happened was part of a series of attacks in Kenya’s Tana Delta, pitting the pastoralist Orma community against the agricultural Pokomo. By September, more than 100 people had been killed, mostly women and children. Although there has been no bloodshed this year, Hiribae Lakole, who lives in the Pokomo village of Mnazini, says his neighbors are afraid it could happen again. “They have a fear to be attacked. That time during the clashes, people couldn’t sleep. They were worried, fearing maybe because they are also Pokomos. So we didn’t know, maybe we shall be attacked,” said Lakole. But a Canada-based organization called the Sentinel Project is trying to prevent future violence by tackling just those fears, often expressed in the form of rumors. There is no radio in the area, so local news spreads by word-of-mouth. With Una Hakika, which means “are you sure?,” users text in rumors they hear, which the Sentinel Project investigates using reliable contacts on the ground. They then send a text back telling the user whether the rumor is true or false. Christopher Tuckwood, director of the project, says that most of the rumors are false. But, he explains, they can nonetheless be the spark that ignites an attack. Violence in the Tana Delta is nothing new. But growing pressure on the land has made it worse, says Deputy County Commissioner for the region, Mike Kimoko. “Much of the causes of the ethnic violence are resource-based. We’ve got the farmers who need property protection. On the other hand the pastoralists want huge chunks of land so that they move during dry spells, during wet seasons,” he said. Tuckwood admits that Una Hakika only addresses the micro-dynamics of violence between communities, not the root causes. But he hopes that with time, the project will help people react differently to hate speech. “I’m confident that in the longer term we’ll engender attitudinal change here, trying to get people to be a bit more skeptical and questioning of information that they hear, especially by word of mouth,” he said. In the meantime Lakole, in the Pokomo village, has been using Una Hakika to clarify the rumors he hears and reassure his neighbors. Even that, he says, can be enough to stop a conflict before it starts. “It can prevent because it will put courage into our people not to put themselves into that fight,” said Lakole. Lakole says his own village has managed to stay out of the conflict so far, and he hopes to keep it that way.